The Project Planner for Excel templates can also be imported into Microsoft Project in order to create Gantt Charts and project plan data can be synchronized between both Microsoft Excel and Project. User-friendly and intuitive task entry. Easy import into Microsoft Project to create instant Gantt Charts. Data can be synchronized between Microsoft Project and Excel. 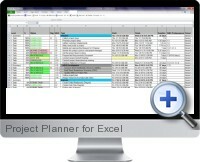 Email task information directly from the Project Planner spreadsheet template. Pop-up Calendar for easy input of start and finish dates. No installation of programs or Excel Add-Ins are required. Color coded task levels that are easily understandable. Required fields are highlighted in yellow and appear behind schedule tasks. Ability to track project changes on the spreadsheet. Advanced version control features available with the version counter displayed on the Project Planner template. Easy to use Project Manager administration screen with password protection. Default formatting is automatically reset to correct any changes made by project team users. Scalable with tests and implementations on large scale projects and performance tested with thousands of tasks. Designed by a certified project manager.